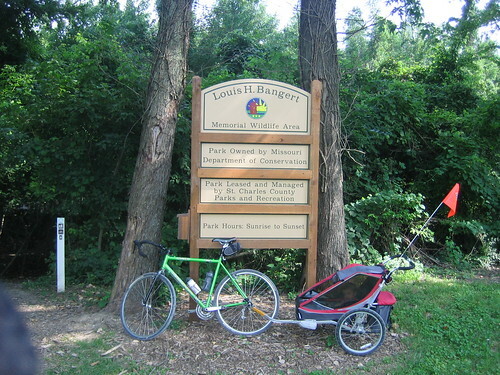 This 160 acre park is between the Katy Trail and the Missouri River just south of downtown St. Charles. 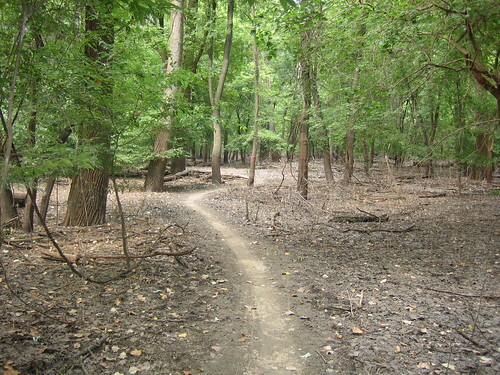 4.2 miles of singletrack, with some sandy areas, have been squeezed onto the island. The main loop is a figure 8 designed to be accessible to the beginning rider with minimal elevation change. The Sandy Loop weaves in and out of the drainage troughs alongside the river edge, offering a change of pace from the flats on the main loops. The trail is subject to seasonal flooding, and once the river level reaches 23', the bridge is no longer accessible. Take I-70 to the 5th Street exit in St. Charles, and head South on 5th Street. Bear left onto the South River Road, and then left again onto Old South River Road. Parking is available on both sides of Old South River Road. Water, food, and restrooms are available in downtown St. Charles, approximately one mile north on the Katy Trail. An island in the Missouri River just south of the Blanchette Bridge, the Louis H. Bangert Memorial Wildlife Area (Bangert Island) was a partnership between the Missouri Department of Conservation and the St. Charles County Parks Department. Under the agreement, the MDC owns the property - following a 1976 donation by Anna Louise Kurtz and Edwin Kurtz to honor Anna's father Louis H. Bangert - and the Parks Department will manage the park through a 30-year, renewable lease. 2016 update: St. Charles City has purchased the land comprised of Bangert Island. The trail has pretty much been frozen, slick in spots but, otherwise perfect for winter riding. Beautiful riding conditions this past weekend- Currently Wet AF- Look for temps in the low twenties before the tread freezes up again. Lower sections are slick. 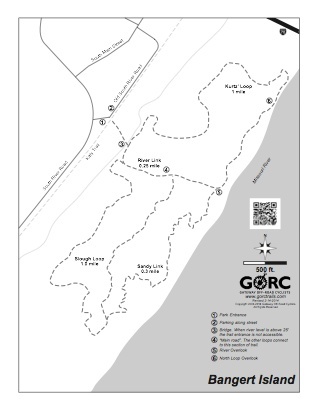 I recommend carrying your bike across the slough, avoid the connector trail and get your riding in on the trail closest to the Missouri River. It's in great shape.